Avoid 8 Basic SEO Mistakes to Improve Your Site's SEO Now ! Attention ! 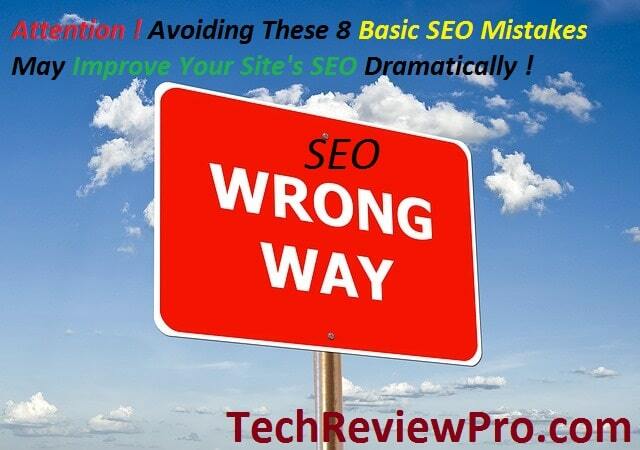 Avoiding These 8 Basic SEO Mistakes Can Improve Your Site’s SEO Dramatically ! Talking about Search Engine Optimization before newbie bloggers is like discussing tedious Calculus [Mathematics] subject in the class of Arts students. But yes, you can’t deny by the fact that “if you have to rule in the world of blogging, you’ll definitely have to increase your site’s organic reach“. And for doing so, you’ll have to work on SEO of your site. No doubt, you’ll have to avoid some basic SEO mistakes that you are committing. But how will you come to know what basic SEO mistakes you are committing ? Well, that’s exactly what I’m going to tell you today ! Do you know, what do I mean by organic reach ? And why site’s organic reach is important ? [Actually, this is for my newbie blogger friends. If you know, simply jump to next paragraph] See you over there. When I say organic reach, it means your site’s visibility in search results. Traffic from search engines like Google, Yahoo, Bing etc. is said to be organic traffic and is considered to be most powerful because this is not only a source of unlimited traffic but also free and evergreen.Of course, it means if your site is well visible in search results at right places, the visitors will never stop coming to your site without much efforts. That is why, organic traffic and organic reach is very crucial. Before I discuss what basic SEO mistakes you are committing and how it may harm your site’s overall SEO, let me say, I really feel sorry if saying “Arts students” to Newbie bloggers (in top most part of this post) hurt you. Actually, blogging is an art and bloggers are like arts students who are very keen to learn and do artistic things. When you are planning to start a new site or even if your site is up and running, you often commit some basic SEO mistakes which you are not supposed to do. Though such mistakes are quite basic but in long run they might proved to be lethal. So it becomes quite important to avoid those basic SEO mistakes, thus improving SEO of your blog and ranking in search engines. Just as smaller steps may lead to bigger goals, in the same way smaller mistakes may lead to bigger destruction ! So let me help you to keep your site away from such destruction… ! Do you know, whatever you publish on your site, it is crawled and indexed by search engine‘s web spiders and crawlers. And once indexed, they appear in search results. Almost everyone knows that, but very few would tell you the fact that it is URL or permalink structure which is crawled first. And hence it is recommended that you must have a permalink structure or custom URL which is SEO friendly. Though I have discussed about the best SEO friendly WordPress permalink structure separately but in most other cases try to keep it short and simple, remove unnecessary terms and make sure URL shouldn’t exceed 255 characters so as to avoid such basic SEO mistakes. This is what many of my new blogger friends avoid doing. Do you think your readers are your parents that whatever you’ll do, it would be pleasant for them ? And they’ll appreciate you. No, my dear ! You are wrong. To keep your readers eye-ball focused on your post, you need to make your post quite different from boring simple plain texts. So make it spicy by including heading/sub-heading fonts, bold/italic fonts etc. Now consider the web spiders and crawlers as modern as you. Let’s say they don’t belong to their early nineties ancestors. Yea, make your post spicy for them too. Use keywords above the folds, make them bold, even italic sometimes, do variations with heading/sub-heading fonts etc. I often see many people committing the basic SEO mistakes of not utilizing these fonts well. It true that an image is worth 1000 words. Because images may do the talking what thousands of words can’t do. So we often use images in blog post. Images are not bad for SEO. In fact, images enhance SEO of your post. But let me tell you an interesting thing. I recently told that spiders and crawlers have become modern but they still have legs only, so crawlers can crawl but can not see. This means, your images are nothing for them. So to make your images optimized to be crawled by them, you need to put alt texts and meta description for your images. So in this particular game images vs text – texts win without any competetion. So using images without alt text is one of those basic SEO mistakes which you must avoid. Let’s say, you know that in modern SEO you have to focus some particular keywords and maintain a good keywords density which would come handy in getting your post ranked higher. And you might be already performing these steps and many of your posts might be ranking higher. But what if those keywords are never searched or very few search for those queries. Of course, this is just a waste of your efforts and hard work. And this is one of those basic SEO mistakes that I committed during my early days of blogging. So I recommend you not to commit these basic SEO mistakes. Research and analyze your keywords well before compiling post. Some useful tools may help you in doing so – Google Adwords [Limited features but Free and Useful], SemRush [Best SEO Tool with many great useful features] etc. Usually webmasters divide their contents in frames to show them efficiently. Such framing of content are said to be iFrames. Though iFrames codes are quite effective way for presenting your site but using iFrames is bad for SEO. Using iFrames on your site may affect your site’s SEO adversely. So try not to use them and if they are must for you, try to keep them as less as possible. Also, iFrames slow-down your site’s loading time which neither your readers love nor search engines. So why are you using them ?? Don’t commit such basic SEO mistakes. It’s true that your readers don’t like plain texts only. So including variations with images, info-graphics, videos, slides, pod-casts and other multimedia resources can make your post spicy and much more interesting. But you know, doing so indirectly hurts your site’s SEO. And this is yet another basic SEO mistakes that many are committing. As such media files are large in size and when included in post, take a large percentage of yours as well as readers bandwith. Thus your site slows down. So limit down the use of such large media files and if possible consider embedding them in the post instead of including as a smart idea. Normally, new bloggers are low on budgets and hence they enjoy using free themes or templates. But doing so they keep harming their site’s SEO as most of free themes contain some sponsored links somewhere or need attribution in footer. Also their theme files are not well coded and even contains some malicious codes. This means harmful links are being indexed often along with your site’s content. Obviously your decision to use free themes/templates is affecting your site’s overall SEO. But still if you wish to continue with free themes, visit these 6 best places to get free WordPress themes, else you may choose a top quality, SEO friendly and responsive theme from any of top quality theme providers like Genesis, Thesis, Elegant Themes, MyThemeShop and Themeforest etc. Mistakes and learning new lessons are part and parcel of one’s life. There is none who learnt everything without committing mistakes. If you are making mistakes, it good sign as you are on the road to learn new lessons in life. Those who are perfect masters of the game today, were once not knowing how to play this game. Yes, but the moment you realized your mistake and started working for correction of that, you are on right path. That’s the fact of life. I hope this post would help you to analyze what basic SEO mistakes you are committing and also how to correct those basic SEO mistakes. If you enjoyed reading this post, consider sharing it ! Was it helpful ? Why not make it helpful for others ! Place it on your social profiles. Of course, Facebook, Twitter, Google+ and LinkedIn are there to help you ! Do let me know, what basic SEO mistakes you are committing ? Also share your views in the comment box below, if I missed any of basic SEO mistakes to mention here. How to Enable Meta Description Tags in Blogger ? How to Create WordPress Sitemap Easily within 1 Minute ? New SEO Techniques : How SEO has Changed and What SEO Changes has Changed in 2015 ? I agree with you with here with all the points you have mentioned and usually these mistakes will lead to poor performance of your blog and ultimately you leave blogging. The most common thing that most bloggers often do is your 4th point that they do not do any kind of keyword research and do not maintain keyword density within their post and hence face the problems..
Yea, you are right. Keywords research is a very crucial factor in building a profitable business blog and this is what many of my new blogger friends commit as a basic SEO mistake. That’s why I have recommended to do proper analysis and research of keywords above. you’ve said it all about SEO.., Truly I’ve been searching for the above mentions, Thanks for Sharing. At least for the few hour i spend on your blog was meaningful and awesome. i hope to get more useful articles in here. Let me first welcome you to TechReviewPro ! Thanks for taking time to drop your kind feedback here. It’s really something that motivates me to keep going as I hear such feedback. Nice post and agree with your SEO mistakes. Some bloggers believe that SEO is dead but I don’t think so, specifically, on page SEO is more important. But over SEO would ruin the blog. A blog post should be clear with good images & links and without grammatical errors. Backlinks play a vital role in SEO and thus linking out to useful (trusted sites) from every blog post would improve our SERP. Really Nice Tips, Every Points Is Valuable. Several factors can make or break a website. So, it is crucial to deal with each and every SEO factor carefully to do it all right. Taking, for example, keyword research and then optimizing the content as per the keywords is one of the key SEO factors but at the same time over-stuffing or optimizing of keywords can have adverse effects on it.